Summer in Athens will be boiling hot, to say the least. In the midst of shows and festivals of various genres being announced every other week for the past few of months, there's a couple that really stand out. 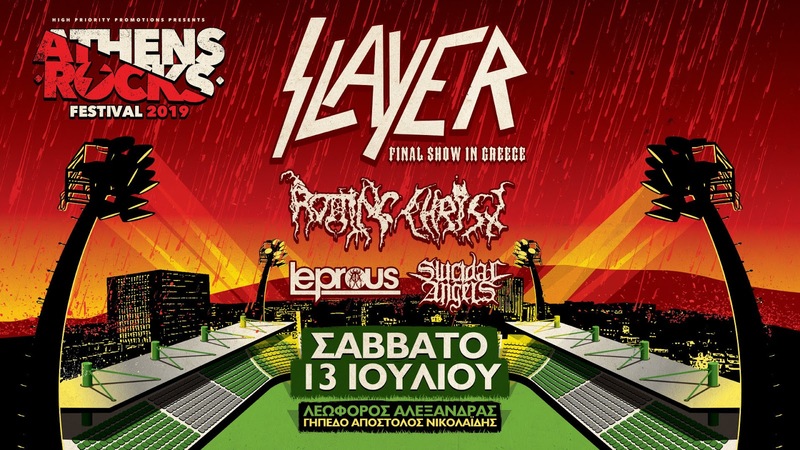 It goes without saying that Slayer's final show during Athens Rocks festival on July 13 is one of the -if not THE- most anticipated events of the year, with fans of all scenes and ages already preparing to demolish the venue. Slayer announced their retirement and the impending first leg of their North American farewell tour back in January of last year, eventually extending it to a fully blown world tour. Following the reveal of Rotting Christ as the second band to join the thrash legends, today two more acts were confirmed, finalizing the billing of the festival. It's only been a few months since Leprous last visited Athens but the impression they left was quite memorable. No wonder the band will be making the grand return to Greece while landing this slot. Suicidal Angels, on the other hand, haven't performed in Athens in a minute so it will be amazing to have the boys and their moshing crew back on this special occasion. The quartet is arguably responsible for resurrecting their scene and their hard work certainly paid off. The show is taking place at Apostolos Nikolaidis stadium. Ticket pre-sale has officially commenced, with limited general admission tickets priced at €42 being already sold out. Tickets priced €48 are available through April 14th and after this, starting Monday April 15th, tickets will be available for €55. VIP tickets (seats at the VIP section of the stadium) will be available for €80 while the High Voltage tickets (€95, very limited) will grant access to ticket holders 30' before doors.